As I mentioned recently in my Stenciled Calendar Cube post, I started working at home just over a year ago. 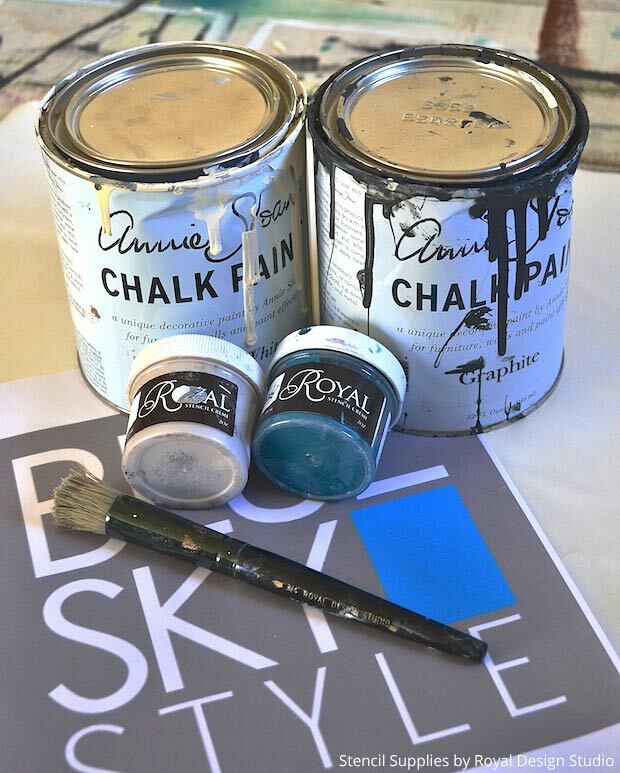 I have settled in for the most part, but since we are working on home office projects on Paint + Pattern during March, I was excited at the opportunity to stencil and art piece that is the logo for my company and blog, My Patch of Blue Sky. 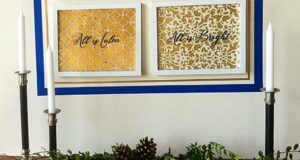 Designs stencils extensively as a professional faux finisher but they lend themselves beautifully also to DIY projects like signs and logos. I emailed basic artwork to the team at Royal Design Studio and they did their magic to create my design. I also included the dimensions of my final project and requested a “negative weed” pattern that allows me to paint the letters in the logo the colors I want. 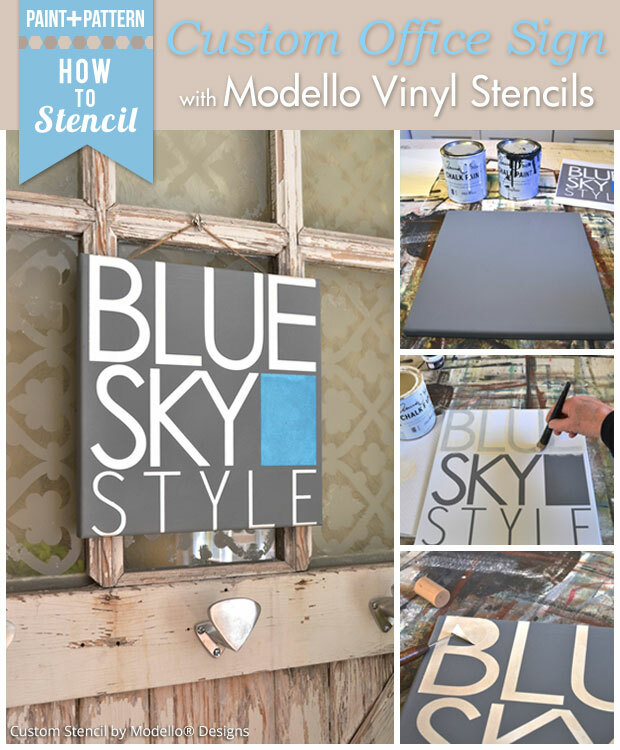 Read more about ordering details for Modello® Stencils. STEP ONE: Brush on two coats of the grey basecoat color. Let dry overnight. 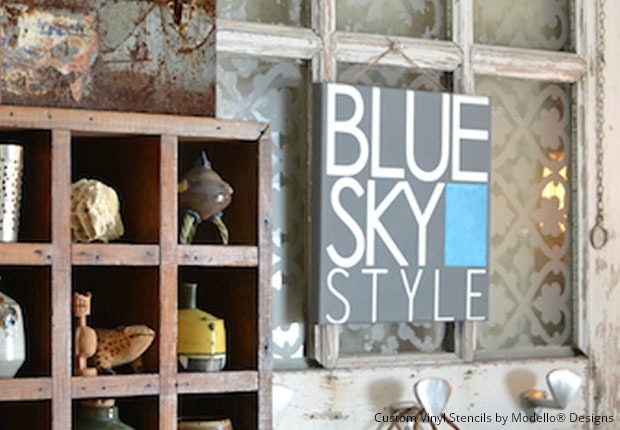 When using an adhesive-backed Modello® stencil it is important to let you surface dry completely. 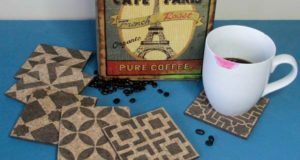 The adhesive stencil will not adhere well to any surface that has moisture in it. STEP TWO: Find the center of the canvas and mark it on tape with a marker at the top. Hold the Modello® pattern up to the light and find the center and mark it. Burnish the front and back of the Modello® pattern with the squeegee tool to help release it. Turn the Modello to the side with the heavy white paper and peel it back from the corner, watching that no little pieces stay on the heavy paper. If they do, just burnish further. Normally I don’t peel the paper completely off. I just loosen it half way, smooth the paper back down and do the other side. If your project is small like mine you can probably peel it all off since it is manageable. Line up the center marks and carefully smooth the Modello® on to the surface, starting at the top and moving down. 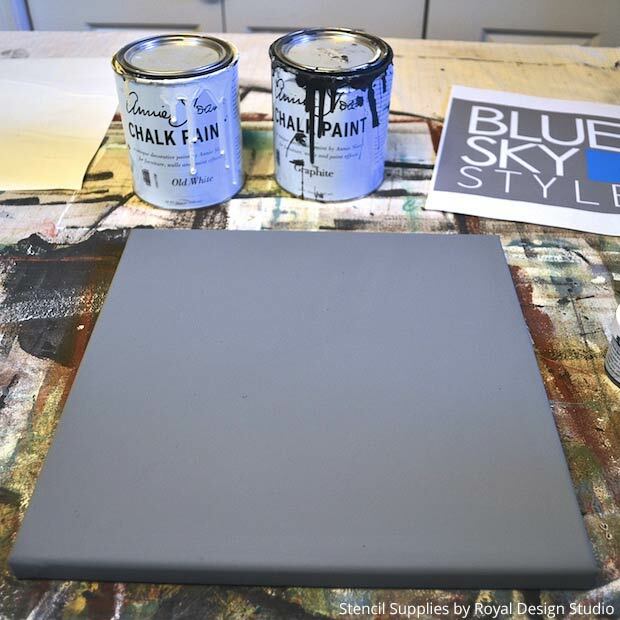 Burnish the stencil down on to your surface. 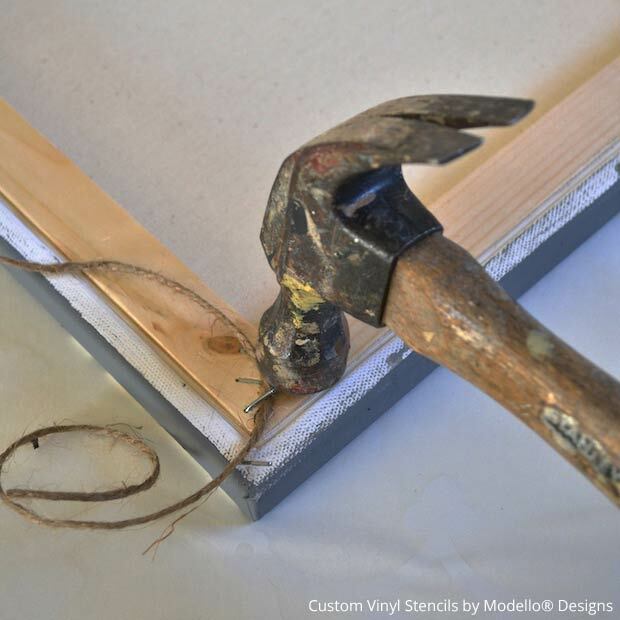 Grab one top edge of the remaining Transfer paper and gently peel peel it off at at 180-degree angle, making sure the design sticks to the canvas. Burnish again. STEP THREE: I chose to use the metallic Royal Stencil Creme paint instead of plain paint to add a bit of reflection. In order to use the Pearl color, which is a bit transparent, stencil 2 coats of Old White first. 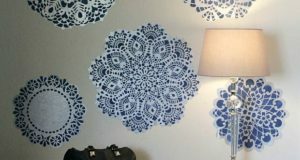 To stencil, dip just the tips of the brush into the paint and offload the excess onto paper towels. Use a swirling motion to fill in the design. I stenciled two coats of the Pearl Stencil Creme and let it dry. After taping off the blue box is to keep the roller from touching the Pearl letters, I rolled on two coats of Teal and let it dry. STEP FOUR: I remove the Modello® stencil with the supplied pick tool, carefully pushing the tip into the material, not the canvas, and peeled it up. To finish it off I hammer two tiny nails on the back and added a jute hanger. What do you think? 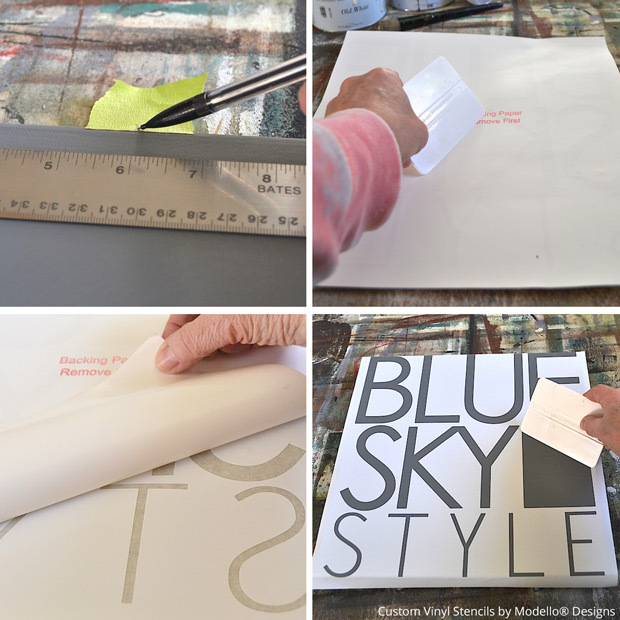 The Modello® vinyl stencil allowed me to get a very crisp logo and use three colors. I hope you’ll give it a try! By the way, see that soft stenciled pattern in the glass panes of my old barn doors? 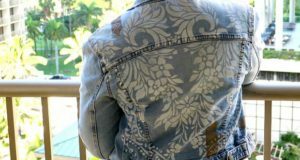 Don’t miss my March Paint + Pattern post on how to get this effect using Etching Cream or spray!